Posted on Thu, Mar 1, 2012 : 2:59 p.m.
Long-time restaurant owner John Roumanis, who owns Ann Arbor’s Mediterrano and Carlyle Grill, recently purchased a vacant downtown Ann Arbor building at 209 S. Main St., and he now plans to open his third restaurant in the location this summer. The building, located next to The Ravens Club, most recently operated as half of the Full Moon restaurant, which closed in 2010. John and Peter Roumanis plan to open a restaurant at 209 S. Main St. in Ann Arbor after purchasing the building. John and his son, Peter Roumanis, now plan to convert the 2,513-square-foot first floor and 2,633-square-foot second floor of the building into a new establishment - a concept they have yet to reveal - and turn the 1,438-square-foot third floor into a loft where Peter will live. The goal: open the restaurant this summer in time for the busy downtown season. Jim Chaconas of Colliers International marketed the building and said the former owner originally wanted to lease the space. He said when John and Peter expressed interest in purchasing it, owner Soon-Young Yoon decided to sell. “She decided she liked what they were talking about and she liked keeping it as a family business,” he said. The downtown building was assessed at $520,700 for the 2011 tax year, making its estimated market value about double that. John declined to name the purchase price. 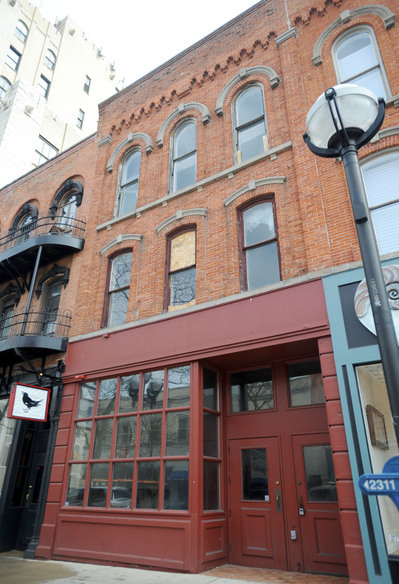 He referred to the purchase as a “tremendous opportunity,” and said the downtown restaurant will round out his other Ann Arbor businesses. Thanks to the father and son duo partnership, changes are also coming to the 17-year-old Mediterrano restaurant off South State Street in Ann Arbor. They hired chef Chris Huey, who worked at the former Tribute restaurant in Farmington Hills and Logan in Ann Arbor, and he is rolling out a series of menu changes. “He’s doing a beautiful tasting menu,” Peter said. And change, John said, is necessary to running a successful business. He said it’s important to watch what is happening locally, regionally and nationally, and to incorporate those changes into your business model. Fri, Mar 2, 2012 : 5:46 p.m.
No that the building is sold, does this mean the garden nome is no longer parked out front? Fri, Mar 2, 2012 : 3:30 p.m. I think that building is cursed or something. Nothing ever works there! Perhaps during the next full moon they need to bring in a Shaman, burn some sage, light a candle for each dead restaurant and beg the demons to leave. Fri, Mar 2, 2012 : 2:34 p.m.
Thu, Mar 1, 2012 : 10:13 p.m.
Aren't half the buildings on that street ex-Full Moons? Thu, Mar 1, 2012 : 8:21 p.m.
John Roumanis came to America from Greece to study in college in Ann Arbor and has become one of the most well-known and respected restauranturs locally. I am sure he will be successful as he has been in past ventures.